If you or one of your family members has been diagnosed with pulmonary fibrosis, chronic obstructive pulmonary disease (COPD) or cystic fibrosis, you may be confused by these three conditions. Because these conditions all affect the lungs, their symptoms may seem very similar. In this article, we’ll discuss each condition to help you understand these three distinct diseases and their expected treatment plans. Pulmonary fibrosis refers to a condition of the lungs in which the tissue thickens and becomes scarred. This condition is relatively rare; the global prevalence of the idiopathic form — the most common form that is not associated with other diseases or as a side effect of medications — is estimated to be 16 to 20 incidents per 100,000 people. The exact causes of pulmonary fibrosis are usually unknown. In these cases, the condition is referred to as “idiopathic.” In other situations, the fibrosis might be related to genetics or result from conditions such as nonspecific interstitial pneumonia, cryptogenic organizing pneumonia or sarcoidosis. Additionally, sometimes medications — especially chemotherapy drugs, heart medications or antibiotics — can cause permanent lung scarring. 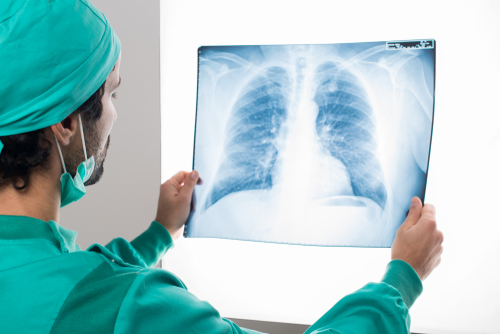 Certain factors may increase an individual’s risk for pulmonary fibrosis. For example, men are more likely to develop the condition than women. Smokers also develop pulmonary fibrosis at higher rates than non-smokers. Regular exposure to housing or occupational environments full of harmful pollutants can also raise the risk for the condition. Scarred lung tissue is less flexible and unable to function as effectively as healthy tissue. In other words, breathing and gas exchange has reduced efficacy, leading to lower concentrations of oxygen in the blood. This leads to visible symptoms such as chronic shortness of breath, even while simply sitting, and a chronic, dry cough. Complications for pulmonary fibrosis include pulmonary hypertension, cardiac failure, respiratory failure and lung cancer. Unfortunately, scarring of the lung tissue is irreversible, and thus pulmonary fibrosis can never be fully cured. However, there are medications that can ease breathing difficulties and slow the progression of the disease. Oxygen therapy and pulmonary rehabilitation are also common options to alleviate the disease’s symptoms and improve lung capacity and endurance. 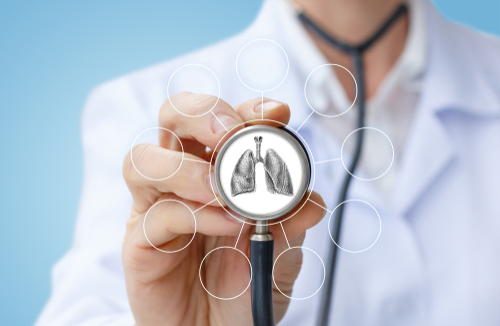 For the most severe cases, lung transplants may be an option. Estimated life expectancy at the time of diagnoses is usually about three to five years. However, many individuals have lived much longer, thanks to advances in modern medicine and treatments. Previously referred to as ‘chronic bronchitis’ or ‘emphysema’, chronic obstructive pulmonary disease (COPD) is a disease of the lung characterized by chronic obstruction of airflow. This obstruction is not fully reversible and interferes with normal breathing function. COPD is usually the result of consistent, extended exposure to pollutants in the air that are harmful and irritating to the lungs. Some examples of these substances include cigarette smoke, chemical exhaust from industrial plants and dust. In COPD, the damage accrued by the lungs over time leads to a loss in elasticity of the lung tissue that is responsible for proper exhalation. When this elasticity is lost, some waste carbon dioxide is left in the lungs at the end of exhalation, leading to carbon dioxide buildup in the body. 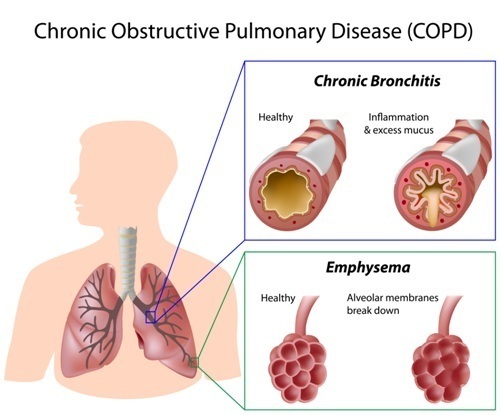 COPD leads to emphysema, which is the destruction of the alveoli, and chronic bronchitis, which is inflammation of the airway tubes in the lungs. Emphysema more visibly manifests itself as shortness of breath. Chronic bronchitis results in a chronic cough and excessive mucus. Other symptoms of COPD include wheezing, a tight feeling in the chest, blue lips and nail beds and uncontrollable weight loss. Unfortunately, the elasticity lost by lung tissue in COPD cannot be restored, and thus the condition cannot be fully healed. However, there are many highly effective treatment protocols that can relieve symptoms and prevent complications. These medications include bronchodilators, oral and inhaled steroids and antibiotics to treat the respiratory infections that often accompany and exacerbate COPD symptoms. Some patients have experienced symptom improvement after taking systemic enzyme supplements. For most mild forms of COPD, treatment other than smoking cessation is not necessary. However, even very advanced stages of COPD can be effectively managed to give the patient many more years of high-quality living. Cystic fibrosis is a genetic disorder that results in thickening tissue and buildup of mucus in the lungs, pancreas, liver, kidneys and intestines. Cystic fibrosis is inherited in a recessive pattern. Both parents must have copies of the defective gene and pass these defective copies down for the child to develop the condition, which affects around 30,000 people in the United States and 70,000 in the world. Individuals with CF develop a thick mucus that can block the airways in the lungs. This mucus buildup results in troubled breathing and an increased susceptibility to respiratory infections, as mucus traps the bacteria and is unable to be removed efficiently. This condition also has severely debilitating effects on the digestive system, resulting in stunted growth and weight. Because cystic fibrosis is a genetic disorder that affects so many organ systems, there is no existing cure, and patients must work closely with a team of healthcare professionals their whole life to manage their disease. Most treatment protocols involve inhaled medication to thin the mucus in the airway, enzyme supplements to help with digestion and techniques for mucus removal. Although extremely draining and time-consuming, these protocols can greatly extend the length and improve the quality of life in CF patients. Some recent research has developed treatment that directly addresses the defective protein involved in CF. If you have more questions, or for more information about your specific condition, consult your physician. How does cf effect someone with copd?